Too long technology has been passive and stagnant in the hotel industry. In the past, the general trend in the industry was “one-system does it all” and hoteliers had no choice but to implement the typical legacy system. These systems being expensive to implement, requiring extensive customisation to fit hotels needs and not allowing any flexibility. A few players controlled the market and used their market positioning to control pricing and hinder innovation. Leading to significant frustration throughout the hotel industry. These systems were supposed to simplify and support the operations, but often created more headaches than they solved problems. Times have changed. Hotels need to leverage technology to stay competitive and ahead of the game. Disruptors as OTA’s and Airbnb have entered the market and have quickly reduced hotels profit margins. Doing this by simply reaching guests via their preferred channels (e.g. OTA’s improving hotels reach via the internet) and answering guest’s expectations (e.g. Airbnb allowing guests to select accommodation based on specific features). There has also been a significant shift in the hotel technology side. Through the introduction of the cloud and Software as a Service (SaaS) a vast number of new players have entered the market, each one specialising in their own niche segment and embracing 3rd party integration. The cloud has allowed to reduce costs and speed-up the pace of development. This has led to the shift in the industry from “one-system does it all” to having multiple specialised systems working and integrating with one another. At the heart of a modern hotel is the Property Management System (PMS), which embraces open integration and connecting with 3rd party systems. The PMS brings all the strings together and allows to streamline all aspects of the hotel experience. The importance of easy integration is not only important to cater the demands of hotel managers, but it makes sure that your system is flexible and future-proof. 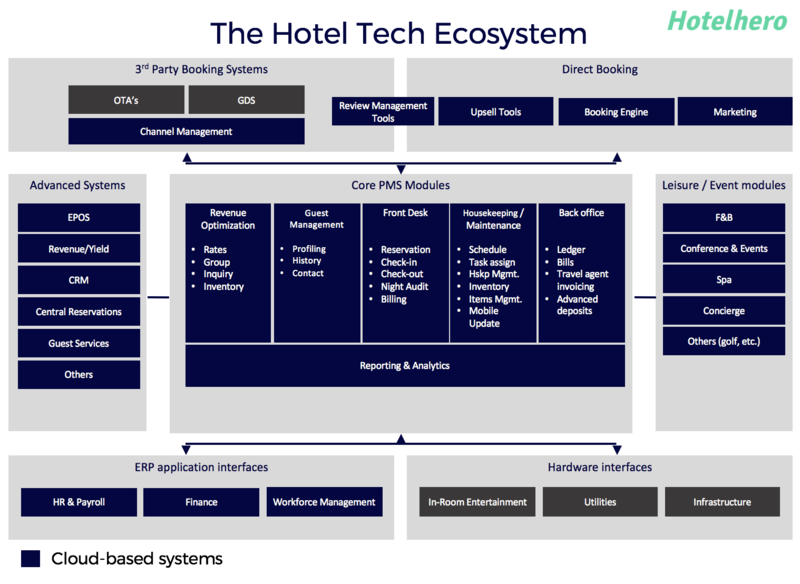 This chart represents the variety of systems a hotel can implement and the importance of their interconnectivity (source). The rapid evolution of the hotel tech environment has not only brought great advantages, but also introduced a new complexity to the issue. Hotels’ technology needs differ depending on their guest type, geographic location, current systems, and much more. Furthermore, as most of these providers are growing start-ups it is hard to differentiate the good from the bad, keeping a clear market overview and actually understand what each product does. Today, the task of hotel technology research and selection is practically a full-time job in itself. Hoteliers being overwhelmed by these tasks, has led to a lack of technological adoption. Especially for independent hotels and small chains, there has been a significant misfit between what exists on the market and what is implemented.